Your weekly rhythm is the pattern you set for the days of the week in your home. 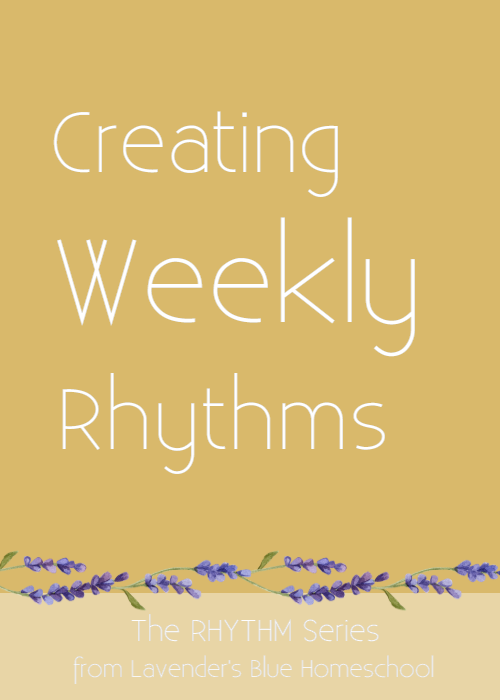 A weekly rhythm is very helpful for your planning, especially as you enter the kindergarten years. It can be a way to structure your week so you get all the housework done, make meal planning easy, bring in the artistic and practical work you want to do with your kindergartener, and make sure you are doing things that you love to do as a family. Having a rhythm for your day helps you to be intentional about how you spend your time, and a weekly rhythm does the same thing. If you find that you struggle with daily rhythms, I suggest that you start right here with a simple weekly rhythm and see how that feels. Children love to know what to expect from each day of the week. The names of the days of the week are too abstract for young children and don’t carry any meaning for them. But having a Painting Day or Baking Day is very meaningful to the young child, and they love it! Your weekly rhythm can be organized around any set of activity or characteristic of different days of the week. I’ve listed a whole lot of possibilities below to get your gears turning. At home you might like to do any number of practical, artistic, or movement activities with your kindergarten child. Some ideas include painting, modeling, crafts or handwork, drawing, gardening, projects, cleaning, baking, cooking, hiking, festival preparation, visits to the park or library, games, swimming, hiking, special adventures, community activities, or homeschool gatherings. Anything which you love to do as a family can be an important part of your weekly rhythm. It doesn’t matter what you choose to do so much as picking things you enjoy doing together! 1. Think about what you tend to do already on a weekly basis. Can you assign activities to certain days to bring them into rhythm? Is there anything you would like to add into your week? Is there anything you can take away which doesn’t match your priorities for yourself and your family? 2. Think about the needs of your kindergarten child (age 4-6). What kind of practical, artistic, movement, or community activities would meet their needs and can you assign those to a certain day of the week? 3. Think about the work you need to do each week in your home, your homeschool planning (in the grades especially), and your meal planning and errands. Can these activities be brought into a weekly rhythm? 4. Feel this out for awhile and get into a comfortable weekly rhythm yourself before you bring it into consciousness for your child. When you feel that your rhythm is running smoothly, you can start referring to each day of the week with its new special name (Baking Day etc.). Chances are your child already has intuited the rhythm of the week and they will enjoy having a name for it.